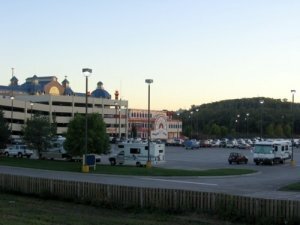 Casino Camper - Review for Ameristar Casino, easy in and out. Large area for RV's in north lot behind casino. no permission needed, good security. short walk across lot to casino. nice grass area along side for pets. flooding is long gone. no hook ups. Bike and walking path adjacent connects to Harrahs Casino to the north.